I write a lot about redundancy and making things easier on yourself when you’re in the field. I subscribe to the philosophy that you should never rely on careful inspection or memory in the heat of the moment. Either train for that until it’s second nature, or develop a system that takes as much of the thinking out of the equation. When push comes to shove, most cables aren’t easily distinguished at first glance. Sure an HDMI to micro HDMI cable is different than a USB 3 A-to-micro-B cable, but when both are black, the same length, and you’re in a hurry they really don’t look that different at a glance. This brings me to my first point, there’s absolutely no reason not to paint or otherwise clearly mark your cables or their connectors so you can more easily tell them apart. I used these oil based paint pens from Amazon. Some cables already kind of do this. For example, the USB standards prescribe colors for the plastic part inside the connectors to denote what they are. Black ( ) USB ports and cables are capable of providing USB 1 or 2 speeds, up to 480 Mbps. Blue ( ) USB ports and cables are capable of providing SuperSpeed (USB 3/3.1 gen 1) speeds of 5 Gbps. Teal ( ) USB ports and cables are capable of providing SuperSpeed+ (USB 3.1 gen 2) speeds at up to 10 Gbps. That said, this isn’t quite ideal, as the USB standard requires one to look at the end of the connector (not at the connector itself) to determine what kind of cable it is, and no other standard (e.g., HDMI) has a color coding process that I’m aware of. Freshly painted USB cables and a still yet to be marked HDMI cable that was the source of my problems on this last trip. I haven’t quite worked out a system yet. My current thought is to use the USB colors on USB cables and do something else to mark the HDMI cables. This was a second big surprise to me; Micro-B USB connectors aren’t as compatible as the standard had lead me to believe. 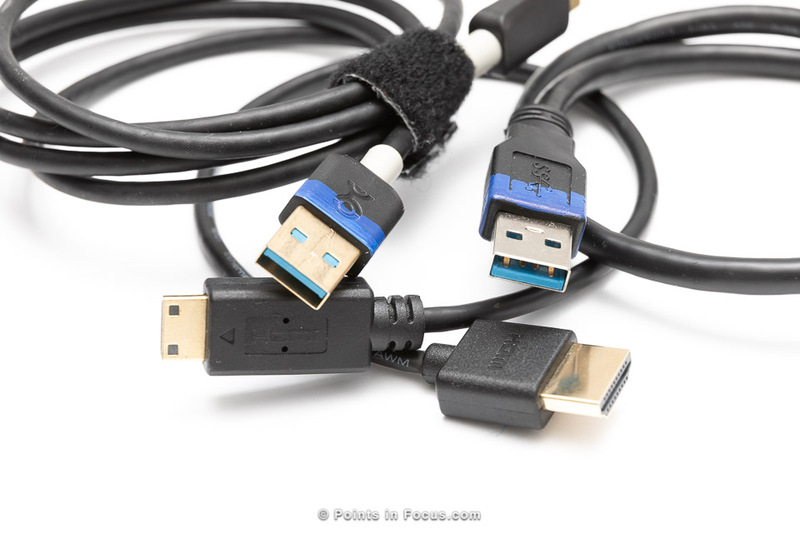 There are two micro-b connectors defined by the USB standards. One was defined in the USB 1/2 standards and is the connector show on the right in the image below. 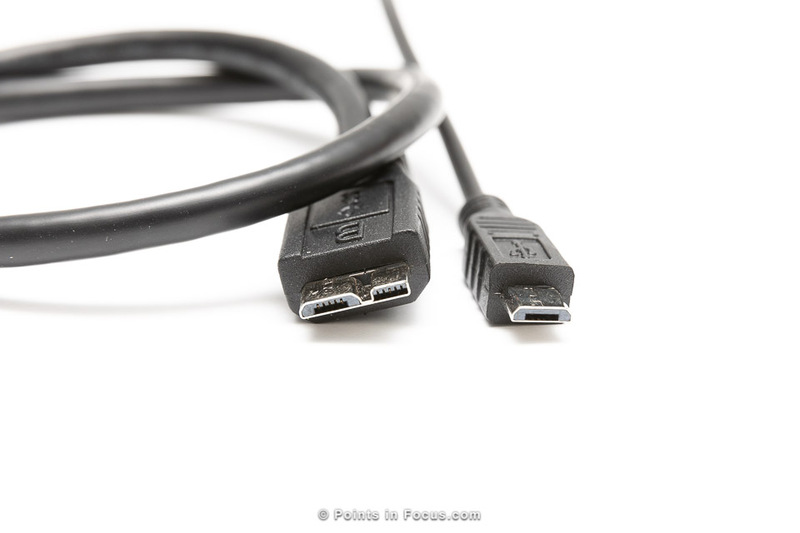 The second micro-b connector was defined in the USB 3 standard, and is the connector show on the left in the image shown below. On the left, a USB 3 Super Speed capable Micro B connector, on the right the USB 2 version. Note how the left side of the USB 3 connector is the same profile as the USB 2 one. When the USB 3 version was designed, it was designed so that the socket on a device was backwards compatible with the USB 2 cable. The right side of the connector with the angled bits, is the USB 2 micro-B connector with the standard wiring and the left side of the connector carries the 5 pins needed for the SuperSpeed data lines and an additional ground. As far as USB 3 devices go, they should work at a reduced performance level, when connected to a USB 2 host or through a USB 2 cable. This is a fundamental part of the idea behind USB. It shouldn’t matter if that part of the cable is missing, or if the device was just plugged into a USB 2 port that doesn’t provide the SuperSpeed lines. The rub is that it doesn’t seem to work this way in practice, and I’m not sure why. Neither my Canon EOS 5D mark IV cameras, or my Transcend card readers, will operate at all without being connected with a full USB 3 capable connection. Or at least, without the cable having the larger USB 3 micro-b connector. I happened to have a USB 2 micro-b cable for charging a cheap USB battery pack, and I tried using it. Neither my camera or card reader would connect to the computer with that cable. I had thought that maybe that cable was defective in some way or was some kind of charging only cable, so I tried with 2 other known good cables when I got home. Neither the camera or card reader was detected by my computer with any of the cables. Had the USB 2 cable worked, I would have been able to download my images, though at a reduced speed but that’s better than nothing. In conjunction with the redundancy above, my choice of cards also played a role in limiting my options. These choices both limited my ability to download cards as well as presented their own problems with respect to write speeds. For the majority of my photographic career, I’ve predominately used compact flash cards not SD cards. This has been the case for many reasons from not having SD card slots in my cameras, to performance. The downside of CF has always been that the cards are more expensive and much less ubiquitous than their SD counterparts. The latter point, ubiquity, plays out in two ways here. Though Apple has since removed the built in SD card reader on their MacBook Pros (booo!) , my mid-2014 model has one. Had I been shooting with SD cards, I would have had the redundancy of the built in reader in addition to my external one. In fact, I could have left the external reader at home and had less things to worry about losing or breaking. Moreover, SD cards seem to do a better job at backwards compatibility than USB cables and devices do. While there are certainly exceptions, any reasonably modern SD card reader will read any SD card. It may not be as fast, but I’ve yet to see it not work at all. Between costs (SD cards are way cheaper than CF cards) and the ubiquity of the format, I’ve subsequently replaced my slow (400x [60MB/s] or slower) CF cards with UHS-I SD cards. They’re faster than what they replaced, and super cheap too. I’m still not a fan of the physical size of SD cards, but with prices around $60 for a 128 GB UHS-I card the cost alone is big consideration. Moreover, at 90 MB/s writes, they’re faster than what they replaced, and more than adequate for all but the fastest paced action shooting. Plus, it’s a heck of a lock easier to find SD card readers random stores in the event I need one. The final point I want to make here isn’t related directly to my problems with respect to forgetting a cable, instead it’s something I discovered in the field while recording video. Or rather trying to record video. Canon specifies that to record 4K video with the 5D mark IV, you need to use a UDMA 7 compact flash card that can write at 100 MB/s or faster, or a UHS-I SD card that can write at 90 MB/s or higher. 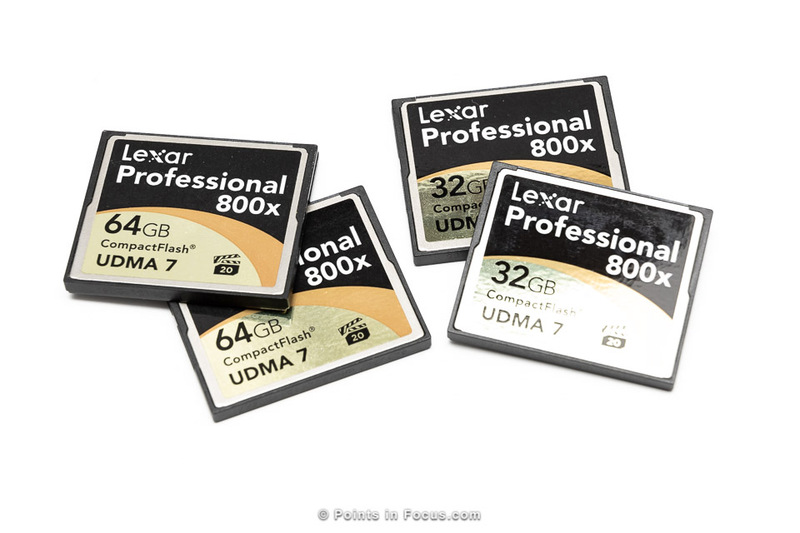 All of the Compact Flash cards I was using throughout this trip were Lexar 800x (120 MB/s) UDMA 7 cards. All of these cards have been tested in the past to support at least 100 MB/s writes (500 Mbps video only requires 63 MB/s), though I hadn’t recorded video on all of them as far as I can recall. Additionally, all had been reformatted per Canon’s recommendations for optimal performance. In my 5D mark IV, the cards on the left can record 4K video while the ones on the right can’t. The 64 GB cards worked fine for 4K video. The 32 GB cards wouldn’t record more than 10 seconds. This is yet another point that’s worth testing before you go into the field. I had assumed, in a large part since I mostly use the 64 GB cards now, that the 32s would preform the same when I got down to them. After all they’re rated at the same speed, carry the same performance marks, and in the past I’ve seen at least 100 MB/s writes speeds to them either in benchmarking or in buffer size clearance estimates. In practice, they failed miserably. Long story short, double check your media works as you expect them to. There’s a caveat to this, SD cards have a number of cooperating standards, for example there’s the SD, SDHC, SDXC standards that define maximum sizes and some aspects of their performance. On top of those standards there are high speed bus standards such as UHS-I, UHS-II, and UHS-III that define ultra high speed modes that the cards can operate at.